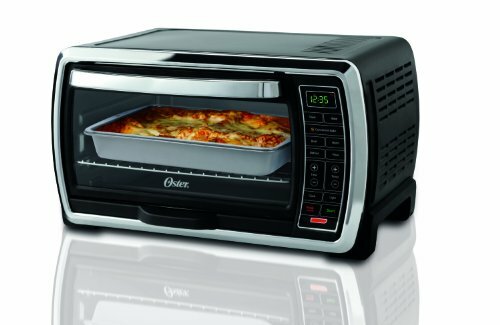 Oster’s large capacity oven TSSTTVMNDG enables you to cook with ease at your kitchen counter enhanced with the excellent convection cooking technology which saves you time and cooks evenly. It was recognized as one of the best products of 2011. It’s also enhanced with an extensive temperature range (150-450°), a 90 minute timer and 7 preset cooking options including bake, convection bake, broil, toast, pizza, defrost and warm, and also a very affordable price. This energy conserving product is very comfortable to use than those traditional toaster ovens. This oven has a very attractive front panel that is easy to interact and controlled digitally. It also comes with touch-to-operate digital buttons that are integrated along with a tiny digital display for timing and power controls, which brings more convenience to users. Digital control is a feature that affects user decision on choosing toaster ovens because it enhances the accuracy of timing and provides the option of exactly controlled time for cooking. With the leading convection cooking technology, this toaster oven gives you one of the best cooking experiences you have ever had. The foods are cooked much more evenly and hence reduce the effort and extra time of recooking your foods or burning those edges of pizza while the rest is still uncooked. Thanks to convection technology which makes it a time saving and energy conserving product. Having a capacity to fit 13″ x 9″ baking and roasting pan, this oven’s large cooking capacity allows you to bake pizzas of size from 9″ to 12″. Large capacity means giving you second-oven convenience and you do not need to cook multiple times if you have a large family or you are having a party at your place. With this oven makes you can stay on the table and don’t need to run back and forth to prepare food. The interior of this oven is properly lit with an in built lamp bulb; that makes the food viewing quite easy while it is being cooked, hence enables you to take a look at the food if you are unsure about the cooking time of a new recipe you are trying. The body of this oven is an improved stainless steel housing which adds to the durability of this oven. The finish of the outer side is enhanced with chrome accents in black and an eye catching polished finish that adds to the classy look of this specific product. This oven also comes with a wider temperature range of 150 to 450 degrees, allowing you to bake and toast foods that need high temperatures for proper cooking. Furthermore, the baking pan and broiler rack provided with this product are enamel coated which makes them a very durable option to use with this oven for baking and toasting purposes. Enamel treated pans and racks last longer and have a decent finish and easy to clean. It also comes with a removable external crumb tray and has two rack positions. What Do Owners Say About The Oster TSSTTVMNDG? Large Interior Space – In my research, I found that this oven has almost the largest Interior in its price range. However, with large capacity this oven doesn’t cost much of your counter space and easily accommodates on your counter top with ease of use. Large capacity also provides an ease of cooking bigger meals and foods that need more space to fit in your regular toaster ovens. Safe Door Handle – Owners love the design of door handle for the reason that although the body gets hot while operating like most other ovens, the door handle is perfectly safe to touch and your hands won’t get burned. Versatile – Most owners praise this toaster oven for its high performance on its multifunction like toasting, baking, heating and defrosting. It does every job excellently. Its convection technology provides a good cooking experience where foods get cooked evenly and saves time and energy. Some owners replace their regular oven by this oven for defrosting something, toasting nuts, warming leftovers. Digital Timer – The 90 minutes digital timer brings much convenience to owners. It allows you cooking continuously without setting the timer again and again or manually shutting off the oven since it is an automatic timer and the oven turns off automatically once the time runs out. Hot Housing – The unit housing being of stainless steel tends to get hot when working, which an oven is meant to be, but still poses a risk of burns, so one needs to be careful while operating this product when it is still hot or working. Use the safe door handle to avoid these problems. Some owners also suggest that it would be nice if the unit had a door switch to turn off the convection fan because when the door was opened it would blow the hot air out. Electrical Hazard – This oven comes with a two wire powering system without a ground option making it a risky option in case any electrical short circuit occurs. They think this is a serious drawback of this product. However, some owners point out it is caused by incorrect use because this oven has a polarized plug. Polarized plug is used to keep the electricity going into the appliance where its’ supposed to go and keeps user from getting shocked while touching and using it. So if you use the oven in the right manner that it was designed to be then you will not be shocked. Who Should Buy Oster TSSTTVMNDG Digital Large Capacity Toaster Oven? Having a large family or parties and get-togethers more often? This indeed is the right choice for you. Consider this product carefully if you have an open kitchen counter since it tends to go hot and owners point out its exposed back poses more burns and fire risks especially if there are any minors around. Overall it’s a good product with multiple cooking options, extensive timer and temperature, digital controls. It is enhanced with convection cooking technology and lit interior compartment with multiple racking options. Durable stainless steel housing and enamel treated rack and pan tends to make it a strong product.